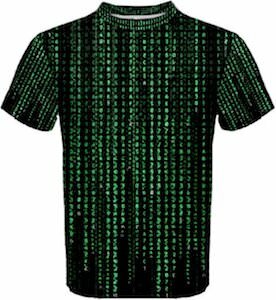 If you remember The Matrix movie then you remember what you are seeing on this The Matrix t-shirt. The t-shirt has an all over design that covers the front, back, and even the sleeves of this t-shirt. On the black t-shirt you can see in green letters and other characters just pouring down and yes that is the Matrix. You can get this cool t-shirt in men’s sizes XSmall – 3XL and it is made from 90% cotton and 10% spandex. When wearing this cool t-shirt people will look and then recognize what is on your shirt and that of course gives you something fun to talk about.